The piña colada, a drink created in Puerto Rico (Spanish: piña, pineapple + colada, strained) is a sweet, rum-based cocktail made with rum, coconut cream, and pineapple juice, usually served either blended or shaken with ice. The piña colada was created on August 16, 1954 at the Caribe Hilton’s Beachcomber Bar in San Juan, Puerto Rico by its alleged creator, Ramón “Monchito” Marrero. Apparently, the hotel management had expressly requested Monchito to mix a new signature drink that would delight the demanding palates of its star-studded clientele. 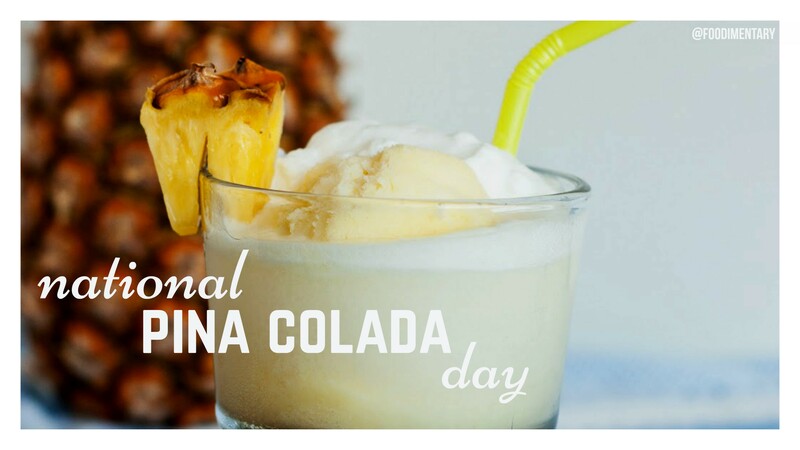 Monchito accepted the challenge, and after three intense months of blending, shaking and experimenting, the first piña colada was born. This story is more credible because the piña colada contains coconut cream as one of the primary ingredients, and the coconut cream of “Coco López” (which is the pioneer) was invented in 1954 in the University of Puerto Rico by Ramón López Irizarry. 1720 Mrs. Clements invented a method of preparing mustard flour or powder, which was known for a long time as Durham Mustard. Until then, mustard was made into balls with honey and or vinegar, and then mixed with more vinegar when needed. (Some sources give the date as June 10). 1839 or 1842 Adolphus Busch was born in either 1839 or 1842 near Mainz, Germany. He founded Annheuser Busch in 1866 with his father-in-law, Eberhard Anheuser. Annheuser Busch is the world’s largest brewer. 1866 The indelible pencil was patented by Edson P. Clark of Northhampton, Massachusetts. This was the equivalent of the ball point pen of the time. It was non-erasable, and you didn’t need an ink well. Used for bills, prices, etc., you could also place a damp sheet of tissue paper over the writing to get a mirror image. It must have been time consuming to get a receipt from a restaurant. 1871 Marcel Proust was born. Marcel Proust was a French writer. On January 1, 1909, he ate a piece of tea-soaked toast whose taste caused on a series of childhood memories. In his 7 volume allegorical novel ‘Remembrance of Things Past,’ the character Swann has a similar experience when he bites into a lemon cookie (a madelaine) which evokes a similar torrent of memories. This is one of the most ubiquitous (i.e., widely-quoted) allusions in literature. 1892 The first concrete paved street is built in Bellefountaine, Ohio. This makes food shopping much easier. They paved Paradise and put up a parking lot for the supermarket. We have lots of paved parking lots (no more oyster shell parking lots), but paved sidewalks are still not very common here in Key West, nor are Street name signs at corners. For a small island, we are not very pedestrian friendly. 1913 The highest temperature every recorded in the U.S., 134 F. in Death Valley, California. 1920 Edward H. Lowe born. He invented Kitty Litter in 1947. 1941 Musician ‘Jelly Roll’ Morton died. 1989 Mel Blanc (Melvin Jerome Blanc) died. Blanc was a voice actor for Warner Bros. (and other) cartoon characters. Some of the characters he ‘voiced’ include Bugs Bunny, Tweety Bird, Porky Pig, Daffy Duck and Sylvester the Cat. 1999 Aaron ‘Bunny’ Lapin died. Lapin was the inventor of whipped cream in an aerosol can (‘Reddi-Wip’) in 1948.